1.Its long service life, large carrying capacity. Due to the use of wire rope as Skeleton Material, polyurethane screen mesh plus polyurethane itself has a very high modulus of elasticity, high strength to absorb impact, high wear resistance, and thus has a high tensile strength, its carrying capacity is more than 2.5 times the rubber screen. Its service life compared with ordinary metal mesh increased 8 ~ 10 times, is 3 times the stainless steel screen surface, is natural rubber 3. 9 times, is currently the world's best wear resistance of the screen surface material. polyurethane screen mesh production material is a polymer organic elastomer, has excellent abrasion resistance, flex resistance, large carrying capacity. the raw materials used in the manufacture of polyurethane screen mesh are specially processed to ensure that they are never delaminated under long-term alternating loads. 2.High screening efficiency.Self-cleaning performance within the screen surface, without clogging, high screening efficiency. Due to the strong water permeability of polyurethane, the sieve taper angle (140°), it is possible to effectively prevent the adhesion of wet fine particles, and therefore suitable for wet fine material screening grade. polyurethane screen mesh adopts imported raw materials, its elastomer and its own good performance of Chi Zhang, effectively avoid clogging phenomenon under dynamic conditions. 3.High screening accuracy. polyurethane screen mesh production process using a mold casting molding process, accurate aperture, high Screening Quality, the particle size of the material under the screen can be well in line with the requirements of the user. 4.A wide range of applications, professional applicability stronger, suitable for any type of vibrating screen machine and machine production. the polyurethane screen mesh is used in hydroelectric power stations, building materials, and other metals mining. 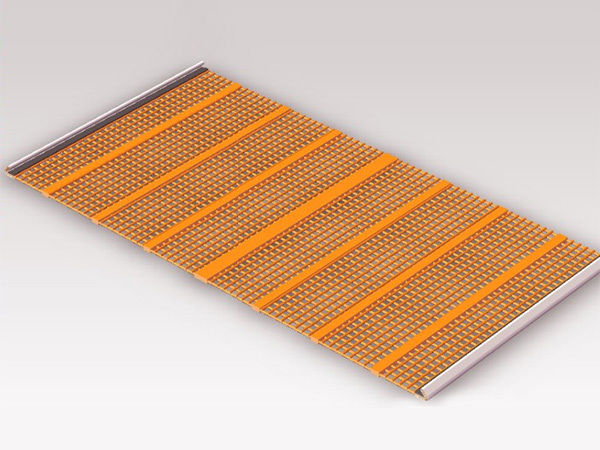 Within the range of 0.1 mm—170mm screening of various materials, regardless of the dry sieve, wet sieve without affecting the screening efficiency. To 0. 5m-3mm dehydration within the range of medium removal sieve, more fully shows the superiority of the polyurethane screen surface. Product water resistance, corrosion resistance, aging resistance, easy replacement, and maintenance. Polyurethane density (1.32 kg/ m 3), lightweight in the metal screen surface, can reduce the production of single consumption, so can adapt to the development requirements of large-scale screening machine. 5. And simple installation, easy maintenance replacement, the product is suitable for any type of screening machine, lightweight, on-site installation or replacement of maintenance, greatly reducing the workload. Next: Does polyurethane screen appear damaged phenomenon such as how to remedy?